Steven Butala: Oh, I started going ahead. Go ahead, go ahead. Jill DeWit: Jill and Steve here. 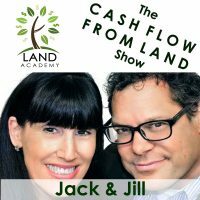 Jill DeWit: Welcome to the Land Academy Show, entertaining land investment talk. I am Jill DeWit. Steven Butala: I’m Steven Jack Butala from sunny Southern California. Today, Jill and I are changing our roles. Jill DeWit: Today, Steven and I talk about buying your way out of a cash crunch. Steven Butala: What the heck would I possibly mean about that? And I’ll tell ya. Jill DeWit: Oh, boy. We can buy … We buy our ways out of a lot of things. Jill DeWit: Let’s take a question posted by one of our members, posted on the Land Investors online community. It’s free. Steven Butala: Christian says: “So a few months ago I purchased a property that appeared to have two broken vehicles on it. One’s an RV, and other is some kind of trailer. The seller confirmed these were owned by his mother, who visited the property when she was still alive.” Typical stuff here. “The seller wanted nothing to do with apparently the junked vehicles, so I bought the property, figuring somebody would see this a positive,” which I agree with. “I’m now closing on the property through title, and they buyer is being represented by a realtor. The buyer is requesting I execute a Bill of Sale so they have an easier time scrapping or getting the registered title for the two vehicles. The title company sent me a Bill of Sale that they drafted up, and after reading it, it seems like I’m opening myself up to unnecessary liability,” which you are. Steven Butala: “I am warranting no one else will claim these vehicles, etc.” You’re signing off on a lot of stuff. Steven Butala: We’ve all seen lawyer-driven documents like this. “I’ve never seen a property as much as inspected the vehicles, so I have no idea what I’m actually signing …” You get the point. Steven Butala: He goes on to say, “In a separate addendum it was not acknowledged that I make no warranties as to the vehicles on the property. However, executing this Bill of Sales seems to contradict the addendum.” The fact is, is that you’re writing this question. It’s out of your comfort zone. Steven Butala: If this is out of your comfort zone, don’t sign it. Jill DeWit: Exactly, I wouldn’t sign it. Steven Butala: And I’ll say this, too, this is what happens when you get a realtor involved in your deals. This is why we don’t do business with realtors on acquisitions and sales. None of this would be happening. Do you think a title agent’s going to say, “Oh, this Bill of Sale, you’ve got to sign it. Oh, this lead-based paint, you have to sign it.” No. The title agent wants you out of their life as fast as possible. Jill DeWit: Well because, too, think about this, these title agents and escrow people, they don’t go out and visit the property. Jill DeWit: They don’t even know. They wouldn’t know if I don’t bring it up, and you don’t bring it. They wouldn’t have any reason to even know that there’s something on the property. Jill DeWit: I think that they feel they have to justify their percentage, their commission. Steven Butala: Something. Whatever it is, it’s not right. Jill DeWit: And they’re about to kill the deal. Congratulations. Jill DeWit: Now you’re not going to get anything because you’re about to kill the deal. Jill DeWit: I wouldn’t sign it. Steven Butala: On the condition of something I’ve never seen. I wouldn’t sign off on it anyway. Steven Butala: If you look … Look, are you an expert on broken down junked out cars and RVs? No. Jill DeWit: Technically, the person that should … This is like, imagine you get title insurance down the road. They go back to whoever was involved in whatever piece of it, to get them to sign off on it. Jill DeWit: So technically, they’re actually hitting you up incorrectly. That’s really … It’s like, “Look, I bought it with these vehicles on there. I’ve got a little note from them saying you can have them. Have a nice day. If you need more than that, you need to go to them.” That’s really what should happen. Steven Butala: What I would, and I’ve done this in the past on deals like this, I don’t let kill the deal, but I’ll take a red pen and mark it all out. Mark it all out and initial and date it. Steven Butala: And say, “No, I don’t warrant the condition of this. I don’t accept the liability for it. In fact, quite the opposite,” and write stuff in there. Because in the end, all these people just want pieces of paper they’re going to file. Jill DeWit: Here’s Steven’s way. This is exactly what Steven would do, and this 100 percent true. Wait, wait, I gotta say. I’m looking for a document here. This is actually good. This is actually from a title agent. So it’s wire instructions, maybe that’s not the best one, but just to … I want to use something as an example, like, I don’t know. Just imagine a document, Steven would take the whole document and do that … You know you do the X all the way through. Steven will do the X all the way through the document, initial that, and sign it. Steven Butala: And they say yes. Steven Butala: What is it with attorneys? Jill DeWit: That would be so darn funny? Steven Butala: They just love to have you be … If you don’t know this, this is what lawyers do, not all of them, some of them. Their goal, and they teach this in law school in contracts. Their goal is to have you out of compliance the second you sign the contract. Jill DeWit: They can do anything they want. Jill DeWit: Anybody can do what they want. Steven Butala: They can just continue to cause problems, get in the way, and bill you. Steven Butala: So literally, that’s what sounds like what’s happening here. They’ve got two junked out cars, and you’re going to sign off on the fact that they’re fine. And you know what? They’re not fine. Steven Butala: You know they’re not fine. Jill DeWit: They’re running, and you have two sets of keys. And we know that’s not true. Steven Butala: Jill and I have brand new beautiful functioning sports cars, and I’ll tell you right now, if I signed off that nothing’s wrong with my car, I’d be out of compliance. Steven Butala: There’s always something wrong. Steven Butala: Always something wrong. So if you’re uncomfortable, don’t sign it. Jill DeWit: Don’t sign it. Steven Butala: Today’s topic, buying your way out of a cash crush. This is the meat of the show. So we all get in … May I? Jill DeWit: Yeah, yeah. That was my take it away. Steven Butala: We all get into cash crunches, all of us. I don’t care who you are. If not, here’s an example of a cash crunch that Jill and I get into sometimes. So, we have buckets of money. There’s an acquisition bucket every month. Steven Butala: That’s not cool to say. Jill DeWit: My bucket is my purse. This is my bucket. Steven Butala: That we use for acquisitions every month, and we frequently run through it. Does that mean we’re out of money? No, it just means that that’s money that we’ve allocated for acquisitions. We’re out. Steven Butala: And for safety reasons. We don’t want to tap into it. If it’s a smoking deal, we’ll bring a partner in or whatever. So, to get yourself out of a cash crunch, you do like every single retailer on the planet. You have a massive sale. Steven Butala: In our case, what we do is auction property off on eBay, or [Bid4Assets 00:06:59] or some place on the Internet to generate tons and tons of cash quickly. Are we maximizing price? No? Are we losing money on a per parcel basis? No. Steven Butala: What we’re generating, 20 to 40 percent instead of making 100 percent. Steven Butala: You know, doubling our money. What doe that do? If you really do the numbers on it, how does this buy your way out of a cash crunch? It allows you … And the only reason you would do that is because you’ve got so many acquisitions lined up that are such smoking deals, you’ve got buy them. Steven Butala: You’re buying your way out of this little cash crunch. Steven Butala: You can have a full blown auction business on the side for certain parts of properties. Jill and I did this for years, and years, and years. Steven Butala: And depending on the quality of the property, and the price, and the situation, that’s how we would sell it. Steven Butala: And we always had, always, had more cash than we did real estate. That’s imperative. That’s really what this show is about. Steven Butala: In a perfect world, you would never own real estate. You would own it for a minute. Steven Butala: You would sign it, own it, sell it. One minute. Steven Butala: Bang, bang, bang. Jill DeWit: Well, even … Yeah, because it sold … The minute … How do I say this? In a perfect world, the minute that the notary is at the seller’s house, handing him the cashier’s check, and they are putting that signed deed in the envelope to send back to you, you had it all ready to go, and you push the button to post the property on the planet. So by the time the deed got back to you, the next day, somebody already bought it. Jill DeWit: That is a perfect world. Steven Butala: And you’re cashed out. Jill DeWit: Because remember, we haven’t talked about this in a while, the minute that the deed is signed, now you own it. It’s not when it’s when it’s recorded, not in your hands, not recorded and back, not that your name shows up on the assessor or the [inaudible 00:09:04] for the tax role, all that good stuff. None of that counts. That doesn’t mean … It’s when it’s signed. So, you have at it. Sell away. Have it ready to go. Steven Butala: Join us next time where we talk about how and why you always have to start with a budget. Jill DeWit: That’s good. And we answer your questions posted on our free online community, LandInvestors.com. Steven Butala: You are not alone in your real estate ambition. We’re actually on time for the first time ever. Jill DeWit: This is kind of going quickly. Kind of a quick one today. But I think we answered it. There’s way to get around a cash crunch. Steven Butala: Share the fun by subscribing on iTunes or wherever you’re listening. While you’re at it, rate us there.